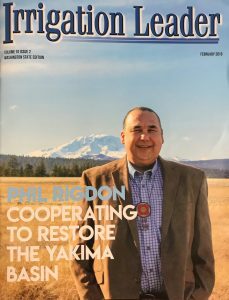 Read an interview with Phil Rigdon (Class 20) about restoring the Yakima Basin. Jon Paul Driver (AgForestry Class 37) is the founder of Hay Kings a 38,000 member global forum for all things forage. Jon shared his inspiration for farming and the creation of Hay Kings. Shawn Clawsen (Class 30) & Boe Clausen (Class 32) both of Warden, WA earn top state honors in a national corn yield contest. Click here to read more! Casey Black (Class 37) was promoted to Olympia Export Manager at Weyerhaeuser. Trent Warness (Class 39) joined the Hancock Natural Resource Group as a Senior GIS Analyst. Robert Mensonides (Class 39) became the Executive Director of the Western Organic Dairy Producers Alliance. Lindsey Williams (Class 40) accepted the position of Director with the Agriculture & Natural Resource Center of Excellence.